Happy Monday!! I am loving neons this summer and I found this super fun button up on sale at Old Navy, the color was neon orange sherbet! Can't get more summer than that haha. But I had to get this top when I saw it! It was such a great color, and it can be worn in so many different ways. I paired it with my new favorite handbag, I got this clutch on Etsy at Reckless Crush and I'm so in love. I've been wanting a Claire Vivier clutch so badly but I didn't want to pay that pricey amount, so this beauty is a great way of getting what I want but not paying a large amount for it! Why not get the same look for less? Love the leopard and the orange together! cute booties! 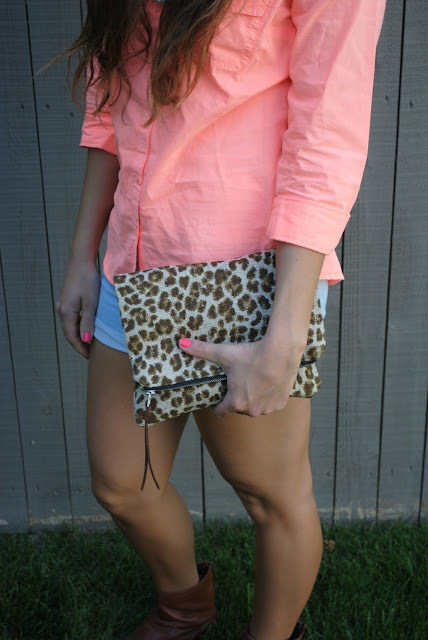 Love the way you styled the shorts with a button down and booties...the whole outfit is great! Love that lipstick color on you! Love that shirt with that clutch! Great colors!